Analog Artist Digital World: Winter Park welcomes Dogs and bans Artists. On December 14, 2015 the City of Winter Park passed an ordinance that makes it illegal for artists to "perform" on Park Avenue, New England Avenue and Hannibal Square. "Perform" is broadly defined as, ,"acting, singing, playing musical instruments, pantomime, mime, magic, dancing, artistry or the sale of visual art and wares." The broad definition is because a city can't discriminate based on content. Any artist caught performing could face 60 days in jail and a $500 fine. To protect our first amendment rights, the city designated Winter Park's Central Park as a "First Amendment Zone." This will make the annual Winter Park Sidewalk Art festival happening this coming March, a perfectly legal money maker for the City and Park Avenue merchants. If I try and sketch that festival from the opposite side of Park Avenue however, I could go to jail. It could be argued that taking a cell phone photo could be considered "artistry" or even witchery so keep those phones in your pockets people. The ordinance, "finds that the existence of street performers … would interfere with the public health, safety and welfare of the pedestrian traffic … [by] attracting audiences which congest the prohibited public area" and would "adversely affect the city's interests in the aesthetics in a city with a unique historic downtown district." To think that a visual artist might attract an audience that could block traffic is ridiculous. Most people don't even notice an artist at work. I'm also surprised they think artists are a public health hazard and ruin a city's aesthetics. The ordinance was modeled after a similar ordinance in Saint Augustine which bans street performers and artists. That ordinance is being contested in court. That ruling is still pending. Winter Park merchants decided they need the ordinance because of some rather loud street performers. One band allegedly used a car battery to power amplifiers that blasted the music so loud that nearby merchants couldn't hear their own store muzak or thoughts. Rather than come up with an ordinance to ban amplified music or restrict noise above a certain decibel level, the city decided to ban all artists. Visual artists are not street performers. They are no more intrusive than a person reading a book, or an iPad. This is something that city officials and law makers do not seem to understand. On January 5th, I was invited by a Winter Park merchant to sketch and report on the opening of their new men's department store. I got to the store a bit early and peaked inside to find the place rather empty. It looked like a boring sketch opportunity. Instead I strolled up Park Avenue with every intent to break the law. I stopped in front of Bank of America and decided to sketch a group of men having a bottle of wine outside the Wine Room. The scene reminded me of a cafe painted by Van Gogh in Provence. Thank god police didn't catch him in the act. Flames flickered up in the vertical space heaters at Luma. For once it was cool enough out so that I wouldn't sweat as I sketched. One person walking by joked that my sketch wasn't complete, since I didn't include the bank's ATM. Another person wanted to shoot a photo of me at work. I allowed it, but now realize that the photo could be incriminating evidence in a court of law. It turns out, that an old friend, was one of the men at the table. He was seated facing away from me, so I didn't notice him at first. When he got up to leave he noticed me sketching and came over to say hello. He joked that most of the men at the table were deviants, but little did he know that he was speaking to a hardened criminal practicing his dark and mysterious craft. I love the warm glow of Park Avenue at night, but I was lucky that I wasn't caught as I tried to capture it. 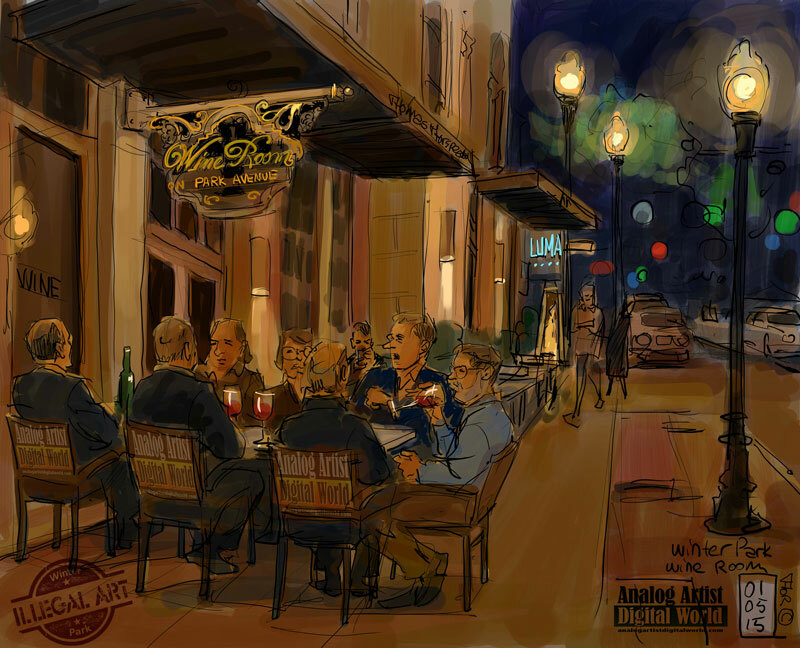 Winter Park is now a place that doesn't welcome artists, so I will simply no longer consider it one of my sketching destinations, unless there are protests against this insane new ordinance. After finishing a sketch, I usually order a drink or food, but this night I slipped away like a criminal into the night. I am the editor of the WaterMark, newsletter for the Central Florida Watercolor Society. I would like your permission to reference your website in the next issue and air your comments on the new Winter Park ordinance. It will be of interest to our Plein Air artists.